I had been looking forward to this gig for months and months, and the inclusion of The Vagaband only served to heighten that anticipation and expectation. Such was my enthusiasm for this triple-header that I was starting to wonder if I was allowing myself to get a little too carried away and building it up a bit too much. Not a bit of it – this was one of the best gigs of the year, or even years. It was superb. Starting promptly at 8pm a seven-piece Vagaband started things off (sans Hugh) and it was only right and proper as The Vagaband it was who saw them at Maverick last year and started off the Norwich-Rainbow Girls love affair by inviting them to the city to play, telling them Norwich would love them. They were not wrong. On that occasion the band were unable to get to the city in time for their slot on the Bo stage but they were accommodated at The Ten Bells, for that legendary gig where they played for hours and hours and had people dancing on tables and dancing throughout the pub in scenes I have never witnessed for a pub gig before. The Girls from California loved it every bit as much as the audience and were begged to return – which they did a few weeks later for a low-key private gig but this was their first return on their current tour. Such a full bill and early start meant people were still arriving when the Vagaband started their set but the room soon filled up and everyone was dancing and singing along as always … not least the Rainbow Girls at the front! The whole band were in fine form and playing brilliantly, sounding tight and very powerful. A nice selection of old and new and upbeat, they almost managed to sneak in Gabrielle at the end of this all too brief set but we were sadly deprived of that as there was a lot of music to fit in for the evening. Speaking to them after their set Marty O’Reilly & the Old Soul Orchestra, also from California, were full of praise and enthusiasm for the Vagaband, who clearly had made a big impression on them. This three-piece ‘orchestra’ (I believe they record as a septet) also appeared to make a big impression on everyone who witnessed their set. Incredible musicianship, vocals, songs and delivery, they were amazing. Marty’s bluesy voice and incredible guitar playing, where at times it almost sounded like there were two guitars, Chris on violin, and Jeff on upright bass were compelling. They played for an hour or more and the standard never dropped for a second, their astonishing version of Smokestack Lightning was one of many highlights. They were obviously having a great time feeding off the energy of the highly appreciative and enthusiastic audience. I could not resist picking up their album which they happily signed for me. What more can be said about the wonderful Rainbow Girls? They delight, charm and uplift wherever they go and however exhausted they might be. On a wretched journey from Leicester the previous night where their van broke down they actually managed to grab a few hours sleep under a tree in a graveyard but were still full of smiles and full of beans, happy to be back in Norwich and to play music. They were visibly moved and overjoyed by the rapturous reception they got again in Norwich, and they obviously have a special bond with the city who have totally taken them to its heart. They played some songs from last year’s album as well as a fair sprinkling of new ones, which went down a storm, especially the one where they taught us the chorus and encouraged us all to stomp and clap along with them. For one of the songs from the album, Dark Night Dinner, they were joined onstage by Ali from the Vagaband on sax, to everybody’s great delight, and for their finale they were joined by Marty O’Reilly and the Old Soul Orchestra. There was even a cover of The Beatles’ “Don’t Let Me Down”. Such a talented group, sharing vocal duties and swapping instruments it all seems perfectly natural and wonderful, the mood all evening was joyous and celebratory, they are superb musicians and have beautiful harmonies. There’s more to the band than might meet the eye though, some of their lyrics are very astute and observational and this is mirrored in some of their artwork which show some shrewd awareness of global mass control but they themselves are as free-spirited as anyone I have ever met. They must surely be having the ride of their lives with their tours and shows but they are living in the moment completely and will have no cause for regrets. They’re a real breath of fresh air and colour and will be welcome in Norwich anytime. The love in the room in all directions was palpable. Brilliant band and very lovely people. A wonderful atmosphere at the Arts Centre, with super sound too. None of the bands on tonight wanted to stop playing. It felt special. It was special. Don’t be fooled by the floaty dresses and the sunny Californian disposition, The Rainbow Girls will come and rock your room by force. Equal parts Ronettes and Stooges, this ‘Electric All-Lady Stomp-Folk Grand Band’ have honed their raw bluesy-folk-dance craft by busking on the mean streets of absolutely everywhere. The joy that they get from playing is multiplied ten-fold as their sound fills an auditorium. Drums, bass, guitar, accordion, uke, mandolin, washboard, harmonica, banjolele, tap dancing, massive harmony singing – all is combined in a whirling maelstrom of good times from which you will do well to come up for air. O’Reilly began his musical journey as a blues guitar player. Through extensive listening and studying of the early delta greats, O’Reilly developed a unique foundation onto which he would incorporate themes from influences in other musical veins such as John Fahey, Nick Drake, John Vandiver, and Tom Waits. Whether it be his original pieces, or his renditions of old American classics O’Reilly tells his story through an old and soulful voice, propelled by a sense of authentic emotional adrenaline. When performing with his trio, The Old Soul Orchestra, O’Reilly is backed by Jeff Kissell on the Double Bass and Chris Lynch on the fiddle. Their versatile musicianship, and soulful chemistry help to expand O’Reilly’s songs into pieces that drive like a ten pound hammer, or float like feather and flow seamlessly in-between. 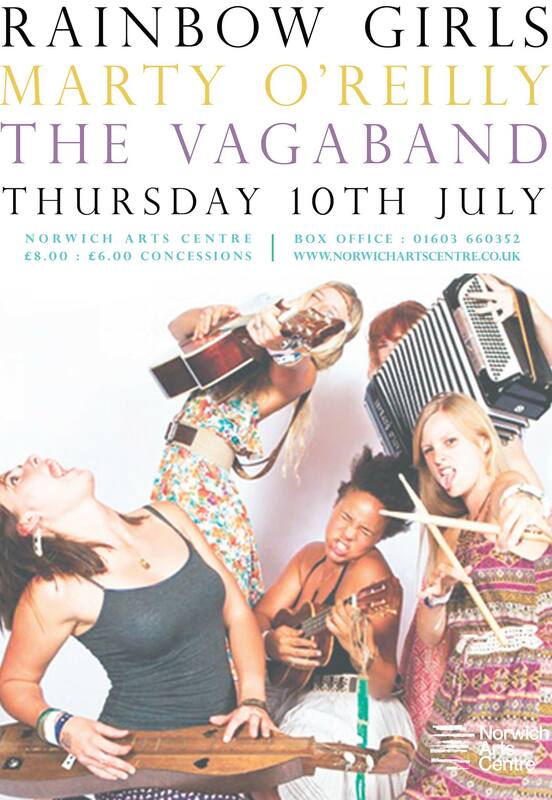 This entry was posted in live music and dance, Norwich Arts Centre, Rainbow Girls, The Vagaband and tagged live music, Marty O'Reilly, norwich arts centre, old soul orchestra, photos, rainbow girls, shashamane, the vagaband. Bookmark the permalink.